Have you ever dreamed of living out a scene from the movie ‘Gorillas in the Midst’ while traveling through Africa? Through gorilla trekking tours, travelers can have close encounters with gorillas in their natural habitat, but it does take some careful planning. 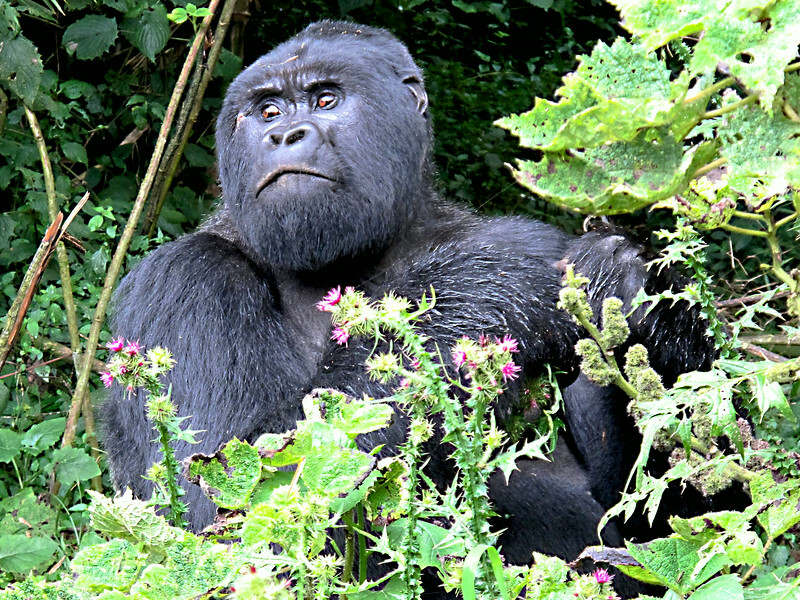 Today’s guest poster, Leslie Burnside, tells us the best way to go gorilla trekking in Rwanda. Many travelers have a bucket list and if you are an animal lover, visiting mountain gorillas in the wild should definitely be on that list. There are several countries where you can visit these majestic animals in their jungle habitat: Rwanda, Uganda and the Democratic Republic of Congo. 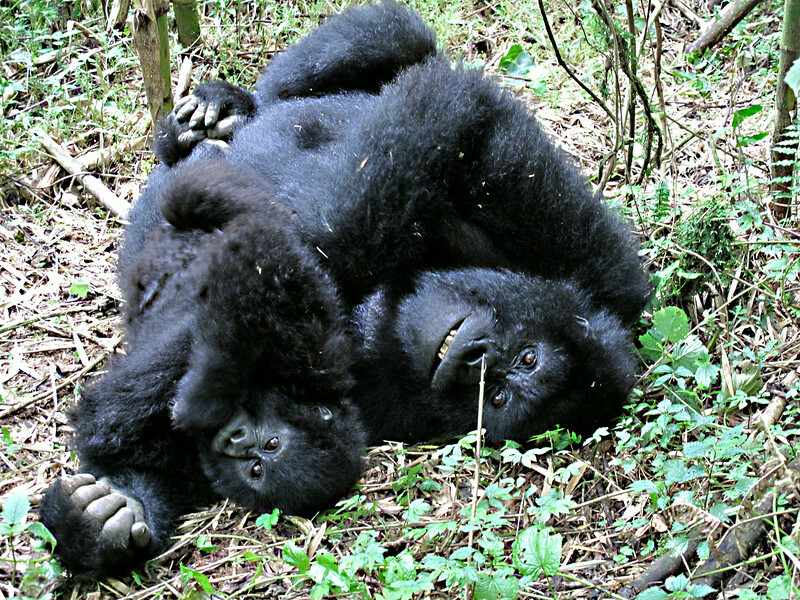 Logistically for most, Volcanoes National Park in Rwanda is one of the easiest places to experience gorilla trekking. We flew to Kigali, Rwanda in May and were met by a driver/guide who gave us a short city tour, followed by a stop at the excellent Genocide Memorial Center. From there, it was a 2 1/2 hour scenic drive up into the mountains past terraced hillsides to our lodging just outside Volcanoes National Park. The next morning we rose early in order to get to the park headquarters for our briefing and assignment to a trekking group. There are currently ten families of gorillas that you can visit, found at varying distances from the beginning of your trek. Each human group is limited to a maximum of 8 people, plus a gorilla guide, lead tracker and porters available for hire. A separate group of trackers go up early in the morning to locate the families and radio back to the guides at the park headquarters who then divide trekkers into groups. 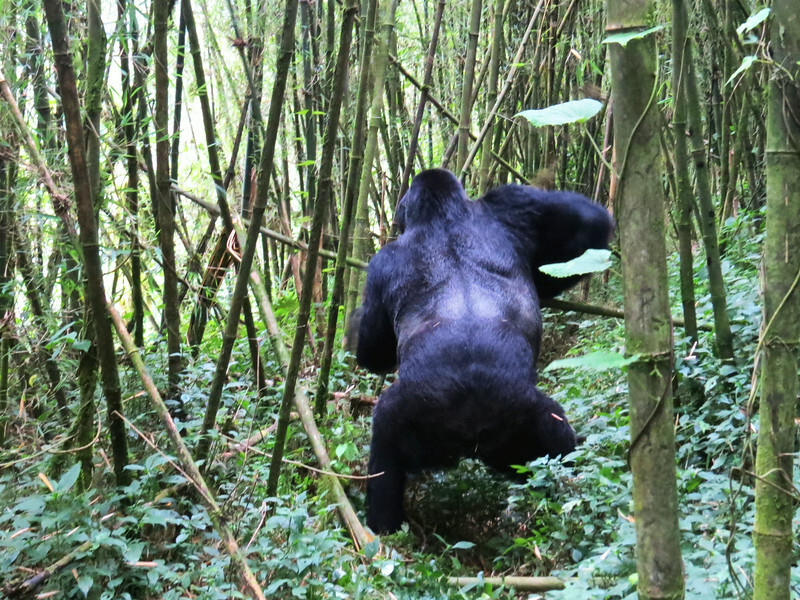 You can specify how long you want to hike, although that may change as the gorillas move around during the day. 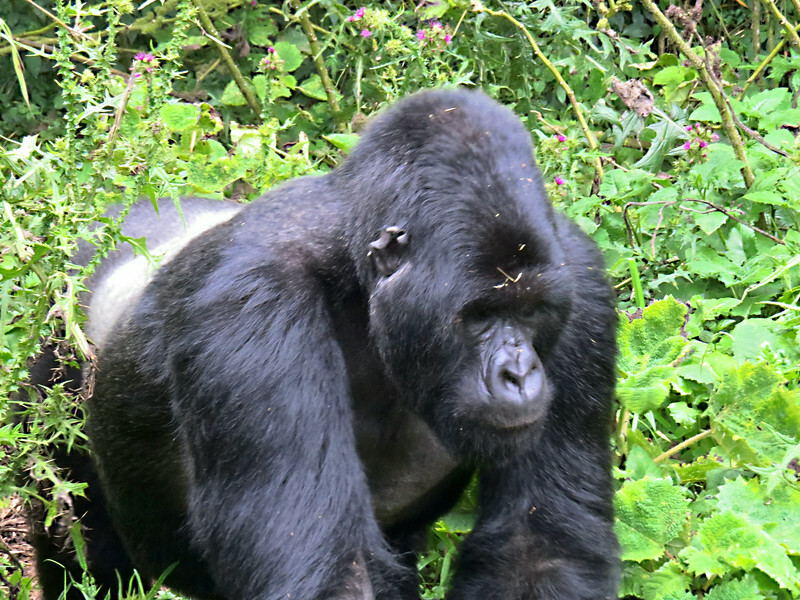 Once you reach the gorillas you spend one hour with them and then hike back down. During the briefing we learned a bit about the family we would visit, what to expect, and the “do’s and don’ts.” Then we drove 20 minutes to the starting point of our assigned trek. Our hike began through farm fields; after 20 minutes we reached the park boundary where we passed through a high stone wall and then inched our way across a bamboo bridge over a deep ditch constructed to keep the animals away from the farms. We entered a thick bamboo forest and began the climb, first gradually and then at more of an incline, dodging stinging nettle bushes and a couple of colonies of fire ants. It was quite slippery and steep in some places, but the porters were always there to grab your hand, anticipating just when you needed help. After two hours of hiking we reached the Sabyinyo family of gorillas. At this point, the porters took our backpacks, water bottles and hiking sticks before we continued further. This family has 16 members, including the largest and oldest silverback of all the groups, plus two additional silverbacks, sons of the “patriarch.” When we reached the first gorilla (#3 silverback) he was eating bamboo leaves and seemed to pose for a while and then literally motioned us to follow him as he pulled branches and brush out of the way. He paused in a clearing to munch on thistles and then sauntered within a foot of our group. We followed him higher up to join the rest of the group and then spent our hour observing the interactions of the group including a mom and baby, rolling around, tickling and smiling at each other. The baby was quite curious; he approached a few of us and even tried to untie my shoelaces. One of the females, Karema, was quite flirtatious, continually smiling at us! Another pair engaged in grooming, and one, nicknamed “the bodyguard”, kept watch over everyone while the patriarch, Guhonda, remained at a bit of a distance. It was a magical experience, and all to soon we had to leave our new found friends. Although park regulations state that you need to be 20 feet from them, we were quite close, just a few feet from them most of the time. Photography is permitted but you cannot use a flash. You need to be quiet, not cough or sneeze in the direction of the gorillas, and follow the guide’s directions. The guides and trackers can speak “gorilla” and read their actions and moods. We felt totally safe the whole time. The best time to go is during the dry seasons, from mid-December to early February or from June to September. We were fortunate to have sunny conditions, but there was still a fair amount of mud. In the rain this trek would have been quite a bit more arduous. Definitely take waterproof hiking boots, rain pants and jacket and sturdy gloves as you will need to push away the foliage in many areas. Gators are available to rent through your lodge and hiking sticks are provided. Trekking permits and lodging should be arranged well in advance. All in all, it is a highly recommended once-in-a-lifetime experience. Have you ever been gorilla trekking? Join the conversation at the My Itchy Travel Feet page on Facebook or send us an email to ask a question or share your experience. I am a former Chicagoan who retired early to the beautiful Southwest. I enjoy traveling, hiking, skiing and photography, as well as spending time with my beloved dog, Luke. I sporadically blog about our worldwide travels and adventures in and around New Mexico at Expect to Fly.